Buccaneers' running back Ricky Bell rushing the ball during 1979 NFC Divisional Playoff Game. As in 1978, McKay thought that a 9-7 record was a reasonable goal for the season. The Buccaneers surprised the NFL by winning the team's first five games, becoming the season’s last undefeated team and appearing on the cover of Sports Illustrated. It also put them in first place for good in the NFC Central. The team’s youth became an issue, as the Buccaneers went into a late-season losing streak on the verge of earning the team's first playoff spot. It was felt that more veteran leadership would have helped the team during the stretch run. Linebacker Dave Lewis publicly stated that the team was “choking”, while Selmon—who had played on the expansion team when it began 0-26—compared the difficulty of getting the playoff-clinching win to the difficulty of getting the team's first win. After dropping three games in a row, of which winning any of the three would have clinched the division, McKay launched into an obscenity-laced tirade against reporters who called the team a "laughingstock" and "Chokeneers". Even against a schedule[note 1] that featured only two opponents with winning records[note 2] it took until the final game of the season for the Buccaneers to win their tenth game. A better division record gave the Buccaneers the division win over the also-10–6 Chicago Bears. Despite being listed by Pro Football Reference as the second-worst team to win 10 games ahead only of the 2012 Colts, the Buccaneers became only the second non-Viking team to win the NFC Central since 1970,[note 3] and the only one to advance in the playoffs. The Buccaneers were considered by many to be an unworthy division champion, even called “cheesecake champions” by opponents, until they advanced to the NFC Championship with a 24–17 victory over the Philadelphia Eagles. There, with several key players injured, they held the Los Angeles Rams to nine points, but were held scoreless on offense to end their season one game short of the Super Bowl. Rookie running back Jerry Eckwood rushed for a team record 121 yards, and the overall total of 229 yards rushing also set a team record. Lions quarterback Joe Reed was knocked out of the game in the third quarter with a groin injury. When Wally Chambers forced the Lions' Horace King to fumble in the first quarter, Lee Roy Selmon returned the ball 29 yards for a touchdown. A 62-yard drive led to a touchdown by Ricky Bell, followed by a 66-yard touchdown pass from Doug Williams to Jimmie Giles. The Buccaneers then ate up 8½ minutes of the third quarter, finishing off with a touchdown pass to Jim Obradovich. The Buccaneers overcame a shaky start in which they were penalized for 80 yards and gave up 17 points in what the St. Petersburg Times called "one of the worst and most frustrating first quarters" in team history. Then, later, they had to overcome a fourth-quarter collapse in which they allowed the Colts to score 9 points that sent the Buccaneers into their first overtime game. Doug Williams’ first pass of the day was intercepted by Norman Thompson, but it took the Colts, hampered by the loss of quarterback Bert Jones and running back Joe Washington, 9 plays to get to the end zone from the Buccaneers' 23-yard line. 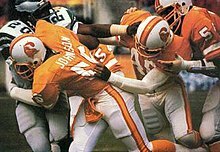 Lee Roy Selmon blocked an extra-point attempt in the fourth quarter that preserved the tie and led to the overtime period. The Buccaneers' ten sacks of Colts quarterback Greg Landry set a new team record. After Randy Crowder stripped the ball from Landry 1:31 into the overtime period, Neil O'Donoghue was immediately sent in to kick the game-winning 31-yard field goal. McKay pointed to the now-stable lineup as a factor in the improvement, saying that previously, the team couldn't call an audible because "one of the guys just got here Tuesday". A Times headline called the team's 2-0 record "amazing". After spending the first quarter making futile attempts at running through the middle of the Packer defense, the Buccaneers sent Jerry Eckwood around the left end for a 40-yard touchdown run. Eckwood ran for 99 yards, while Ricky Bell added another 97 on the way to a team-record 235 rushing yards. Jim Youngblood, who had been in on the sack that broke Doug Williams' jaw the previous season, returned an early interception for a touchdown and a 6–0 lead. Shortly thereafter, Bill Kollar recovered a Lawrence McCutcheon fumble at the Rams 27-yard line, leading to a 15-yard touchdown reception by Larry Mucker. Neil O'Donoghue's extra point gave the Buccaneers the lead for good. The Buccaneers further added a 5-yard touchdown run by Ricky Bell and a 29-yard scoring pass to Jimmie Giles, all before the end of the second quarter. The Rams failed to cross midfield at all in the second half, and were held to only 97 yards passing on 35 attempts. McKay, familiar with Rams quarterback Pat Haden from having coached him at USC, tailored the defensive gameplan towards him. A 65-yard screen pass from Vince Evans to Walter Payton gave the Bears a 13–10 lead. The Buccaneers answered that with a drive that ended with an eight-yard touchdown reception by Isaac Hagins. This score, with 5:08 left in the game, put the Buccaneers ahead of the Bears and left them as the only remaining undefeated team in the league. It was the third consecutive loss for the Bears. Jerry Eckwood also contributed a 61-yard touchdown run, the longest running play in Buccaneers history to that point. A broken wrist suffered in this game would contribute to Eckwood's diminished performance later in the season. The undefeated Buccaneers lost on the road to the winless New York Giants. Giants quarterback Phil Simms, in his first NFL start, went 6–12 for 37 yards. Billy Taylor, also making his first start, became the first Giant to rush for over 100 yards in a game this season, running for 148 yards and two touchdowns on 33 carries. Doug Williams threw touchdown passes to Larry Mucker and Jimmie Giles, but also threw three interceptions and numerous incompletions. Archie Manning, who entered the game leading the NFL in passing yardage, went 11 of 14 with a touchdown each rushing and passing. Mike Strachan rushed for two touchdowns. The Buccaneers broke their two-game losing streak as Ricky Bell set a club record with 167 rushing yards, while Doug Williams threw for two touchdowns and rushed for a third. The total of 228 rushing yards was 7 yards shy of the team record set in the previous game against the Packers, and left the Buccaneers as the only team with two rushers on pace to break the 1,000-yard mark. Packers quarterback David Whitehurst threw for a career-best 261 yards, although the Packers never entered the end zone. Jeris White intercepted a potential touchdown pass that slipped out of James Lofton's hands. The win left the Buccaneers at midseason having already achieved their highest win total ever. The Times noted that the Buccaneers, which "would unearth a new way to lose" during the 0-26 losing streak, now "keep discovering different formulas for victory", with a strong game by Doug Williams despite a weak rushing attack. The team survived a last-minute drive by the Vikings in which quarterback Tommy Kramer was penalized for throwing a pass from beyond the line of scrimmage, which helped to keep the Vikings out of field goal range. Curtis Jordan sealed the victory by deflecting Kramer's last-second Hail Mary pass. Kramer later admitted to being aware of having crossed the line of scrimmage, but had hoped that the officials would miss it as they had missed so many other penalties in the game. The Buccaneers' 7-2 record was equal to that of the Super Bowl XIII teams Pittsburgh Steelers and Dallas Cowboys. Both Buccaneers and Vikings complained about officiating errors and the malfunctioning game clock. The Metropolitan Stadium 30-second clock failed for the second week in a row, as did both regulation clocks. The Times warned "'Going down!' Buccaneers reverse direction again", as the Falcons controlled the ball for 41 of 60 minutes. An inability to complete long passes, combined with fumbles, prevented the Buccaneers from taking what could have been a large early lead. Isaac Hagins' fumble to Atlanta's Tom Pridemore set up a 31-yard field goal. The Buccaneers maintained a halftime lead, despite having held the ball for only six minutes and 18 seconds in the first half. Falcon blitzing disrupted Doug Williams' passing, and Ricky Bell and Jerry Eckwood were held to 72 yards rushing. Eckwood's fumble led to Atlanta's go-ahead touchdown with 11:10 remaining. Bubba Bean's 60-yard run with 1:22 remaining clinched the game for the Falcons. A 69-yard Williams-led drive brought the Buccaneers to within three points with 28 seconds left, but the Buccaneers failed to recover the ensuing onside kick. The Buccaneers' error-prone play, of which McKay said "we didn't play with very much intelligence", required a late comeback to defeat the 1–10 Lions. The Buccaneers scored 10 points and recovered two fumbles, all in the last four minutes, to pass the Lions and maintain their two-game division lead over the Chicago Bears. This was the Buccaneers' sixth come-from-behind win of the season and they finished with a 4-0 road record against division opponents. After Neil O'Donoghue's fourth-quarter field goal, Dewey Selmon forced a Detroit fumble that was recovered by Dana Nafziger at the Lions' 23-yard line. Doug Williams followed this with a 23-yard touchdown pass to Larry Mucker. Mucker, who earlier had been fined for missing the team bus to the stadium, beat close coverage from Walt Williams to make the catch. The Buccaneers routed a Giants team that came in having won 5 of their past 6 games. Giants quarterback Phil Simms was sacked 5 times for 75 yards, intercepted twice, and gave up two fumbles. One Cecil Johnson-caused fumble was picked up by Dave Lewis and returned 39 yards for a touchdown. Both sides denied running up the score during either of the season's matchups, though the Tampa players were said to have approached this game as a grudge match. The game was mostly devoid of the trash-talking that had characterized the previous meeting, the Giants having little room for words. The Giants' 3 points was the lowest score allowed by the Buccaneers, and the Buccaneers had their second-highest point total with 31. The Buccaneers used a two-tight end set, providing additional blocking that helped spring Ricky Bell for 152 yards in three quarters of play. Bell spent the fourth quarter holding an ice pack "...to keep Ricky from getting a swollen head", joked coach McKay. The win left the Buccaneers with an NFC-best 9–3 record, ahead of McKay's 9-7 goal and the team's 5-11 record in 1978. The Times speculated that a 13-3 record was "plausible", because three of the four remaining games were at home and the fourth was against the weak 49ers. In a game that would have clinched the Buccaneers' first playoff berth, coach McKay was booed after a one-point loss in which three kick attempts were blocked. A touchdown drive by Doug Williams in which he ran the ball into the end zone with 19 seconds remaining turned out to be futile, as Wally Hilgenberg's blocked extra point left the Buccaneers one point short of tying the game. Various special teams miscues erased a good offensive day, in which Williams went 19 of 38 for 252 yards (including 5 of 7 for 52 yards and 25 yards rushing on the final drive), and Ricky Bell's 101 yards rushing put him over 1,000 for the season. The Buccaneers' 182 rushing yards moved the team into first place overall in the NFC and second in the league after the Jets. The team had the sixth-best passing record in the conference, and the best pass defense and second-best rush defense. The Times nonetheless reported that the locker room was more subdued than during the 0-26 losing streak: "One by one, the players filed out grim-faced, reluctantly said a few words and then left". An angry McKay complained, "I'm sick and tired of people booing me. I wish they would boo the people who can't block", and had to issue a public apology after shouting an obscenity at the end zone stands, saying later that he was angry over racist statements being made from that direction. This was the first game that Pat Summerall and John Madden announced together. Doug Williams completed only 5 of 19 passes for 60 yards with four interceptions before being pulled in favor of Mike Rae. Bears quarterback Mike Phipps completed six passes, all to Dave Williams. The Bears scored on one of those receptions, and on a Walter Payton run. The Buccaneers' Williams was nearly ejected from the game after throwing Bears lineman Mike Hartenstine to the ground by his face mask after a Gary Fencik interception. The Bears' five interceptions were their most against the Buccaneers. The Buccaneers' play was later described as "flat" by Bears players. Wally Chambers dismissed talk of the team's inexperience, noting the intensity with which the team had played against the Giants two weeks prior. The last time the Buccaneers had been shut out previous to this game was the last game of their 0–26 losing streak in 1977, also against the Bears. Still needing only one victory to clinch the division, the Buccaneers lost to the San Francisco 49ers in O.J. Simpson's final home game. It was the second year in a row that the Buccaneers lost to a 49ers team that entered the game with a 1–13 record. The 49ers scored first, as Jeris White slipped while covering receiver Mike Shumann, leaving Shumann open for a 19-yard touchdown reception. The offense's single touchdown, a 19-yard pass from Doug Williams to Jimmie Giles, was a season low, while injuries to Mike Washington and Cedric Brown left the Buccaneers' secondary vulnerable. Mike Rae again saw duty at quarterback in the fourth quarter, with the game out of hand. Williams, who tearfully accepted blame for the loss, threw five interceptions that left McKay considering either benching him or avoiding pass plays. McKay also criticized the offensive line's blocking, saying that he "saw (Ricky) Bell make some long runs, maybe two or three inches". Under pressure of needing to win one game, the Buccaneers' tension ("state of shock", according to McKay) was noticeable to 49ers players. The Associated Press called the game a "humiliating" loss against "13-time loser San Francisco", and Lewis described it as "choking". When reporters described the team as "Chokeneers" and a laughingstock, McKay denounced them and Lewis in what the news agency described an "obscenity-filled tirade", stating that "the word choke is terribly degrading. He ought to shut up ... and see how he played", and "People who use those ... terms are no better than snakes". The loss dropped the Buccaneers into a first-place tie with the Chicago Bears in the NFC Central, to which the Times said that the Buccaneers were "now in the process of presenting" the division championship. Playing in a torrential downpour, the Buccaneers scored the first shutout in franchise history to clinch their first playoff berth and the NFC Central title in what would become known as "the Rain Bowl". The Chiefs were held to a franchise-low 80 yards of total offense. Despite the rain, Ricky Bell claimed that the field had better traction than the dry field they had played on the week previously in San Francisco. Bell carried the ball 39 times for 137 yards in such bad weather that the game had to be played under lights. The Buccaneers lost four previous scoring opportunities to a fumble, two interceptions, and a fumbled snap on a field goal attempt. Shut out of the end zone on three tries with first-and-goal from the 9-yard line, the Buccaneers brought Neil O'Donoghue in to kick what would be the winning field goal with 8:50 remaining. Tampa Bay would hold the ball for all but four plays for the rest of the game. The Chiefs players gave the Buccaneers little credit after the victory, saying that the AFC was superior to the NFC and that the Buccaneers would never have won the AFC West. While stating "you have to give credit where credit is due", Cal Peterson, a member of the first Buccaneers team, was among the Chiefs who agreed on the AFC's superiority. O'Donoghue admitted ("In my two years at Auburn, we won about three games") that he was playing on a championship team for the first time since youth soccer in Ireland, and linebacker Lewis said "We won't be called the Chokeneers any more". ^ Pro Football Reference says that the only teams since to gain an easier schedule than the 1979 Buccaneers were the 1991 Buffalo Bills with five games against teams 4–12 or worse and the 1999 St. Louis Rams with only one game against a team with a winning record (ironically against the Titans, whom they would defeat in the Super Bowl). ^ These were division rivals the Chicago Bears and the 9–7 Los Angeles Rams. ^ The other non-Viking team to win the NFC Central during the 1970s was the 1972 Green Bay Packers, who finished 10–4 to the Lions 8–5–1 and the Vikings’ 7–7. ^  1979 draft at pro-football-reference.com. ^ Sports Illustrated. 1 October 1979. ^ Mizell, Hubert (1979-11-05). "'Going down!' Buccaneers reverse direction again". St. Petersburg Times. p. 1C. Retrieved 2019-01-04. ^ Tierney, Mike (1979-11-26). "Vikings block Bucs' title clincher". St. Petersburg Times. pp. 1C, 24C. Retrieved 2019-01-04. ^ Mizell, Hubert (1979-12-10). "One step from glory — or doom". St. Petersburg Times. pp. 1C, 11C. Retrieved 2019-01-05. ^ . pro-football-reference.com. Accessed 8–25–09. Archived 2009-09-03. ^ . pro-football-reference.com. Retrieved 8–25–09.